We’re not sure where the fascination to have your libations flung at you came from, but we can’t say we’re entirely against it. This beer catapult robot (dead link try Internet Archive) will pull a cold one from its gullet and fling it to you, or in your general direction. While he doesn’t have the source code available for the Arduino bit, we’re OK with that. We’re more interested in the mechanisms at work here and there are plenty of pictures of his set up. It seems very similar in design to this one we covered back in 2007, which also appeared on” The Late Show with David Letterman”. Join us after the break to see the thing in action. 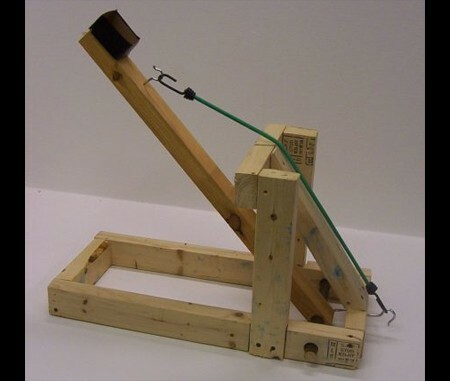 Today we’ll be setting aside the circuits and solder for a little while in favor of good old fashioned wood and bungee chords to make this backyard catapult. Items needed include nine sections of 2×3 wooden beams of varying lengths, some screws and eye hooks, a bungee chord, a broom handle, and a few other things which are all detailed in the read link below.